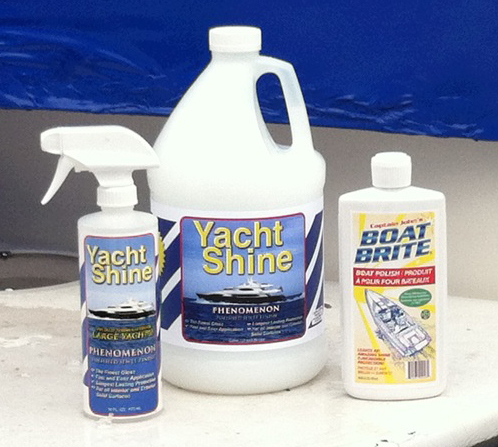 As I mentioned in my last post (Part I), we’re bringing back the Boat Brite Polish – and when paired-up with the YachtShine Phenomenon, you’ll achieve a brilliant and long-lasting shine and protection. I’ve named this dynamic duo, the Ultimate Finish. So what’s so different about the Ultimate Finish? First and foremost is the way the Boat Brite Polish is applied. Wet. Yes that’s right, as in wet from water. And the grand finale is delivered by the YachtShine Phenomenon. Think back to the last time you polished or waxed your boat. Perhaps it was last spring or maybe even last Fall before being tucked away for winter. 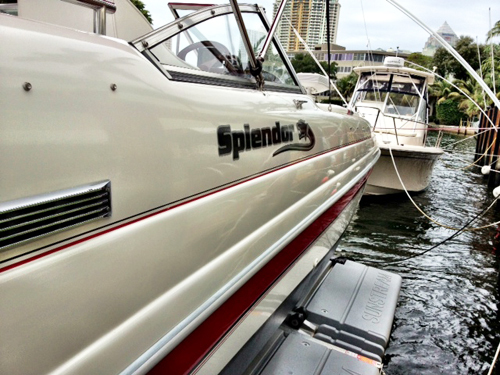 Usually we start by washing the boat with soap and water if water is available or a spray and wipe cleaner. Then it’s time to put a coat of wax or polish on. If you’re like me I’ve always started the application with a new applicator – usually it’s a white terry-cloth wrapped sponge. So then we take a dab or squirt and begin the process that will hopefully have us standing back and admiring the beautiful shine. I usually start at the starboard aft corner and work my way forward. Maybe two or three feet from where I started I need to reload the applicator – but something is different about the applicator. When I started it was white, right? Why the heck is it sort of a light brown now. I mean I washed the boat right? Weird…but on with the show. And in a few minutes another reload and now the applicator is no longer light brown - it’s brown! What’s causing the applicator to get brown? Dirt. In the microscopic pores of the gelcoat or paint there’s dirt that our washing didn’t get. And because all polish or wax products have mild cleaning agents in their formulation, and these along with the pressure on the applicator, are extracting the imbedded dirt and your applicator has collected it. So, let’s say you have a twenty or thirty or maybe a forty foot boat – except for the first couple of feet where you started, the collected dirt is getting ground back into your gelcoat or paint. And if you’re grinding 20, 30 or 40 feet of collected dirt back into your boat – it just ain’t gonna look as good as it should. Applying the Boat Brite Polish is different. So, rewind to the start of the process but add a bucket of fresh water. Take the same white applicator and submerge it into the bucket of water. Bring it out and squeeze the excess water and put a squirt of the polish onto the wet applicator and apply to your boat. I like straight strokes but circles work just as well. Be sure to put light pressure on the applicator to extract the deeply imbedded dirt from the porosity. Now, before you reload with a new squirt of polish, first submerge the applicator back into the bucket of water, swish it around to release the captured dirt, pull it out, squeeze out the excess water, reload and apply. Now let the polish dry. Depending on the size of your boat and your climate, where you started may already be dry. You can test to see by wiping off the polish with a clean, dry terrycloth towel. If it wipes off easily you can proceed but if it is not real easy let it continue to dry. When it has dried, lightly buff your boat with the terrycloth towel (rotate the towel often and “snap it” to get rid of the polish dust). Then stand back and admire your efforts. And then… drum roll please… break out the YachtShine Phenomenon. What!!? ?, you say – or was that your rotator cuff? Don’t worry, the grand finale – the Phenomenon application – is a piece of cake, a walk in the park; it’s like throwing a medicine ball a hundred times and then throwing a wiffle ball, when compared to the polish application that you did so well and with epic results. Honestly, the Phenomenon application is like washing a window…simply spray the Phenomenon, using a clean microfiber cloth spread it as far as it will go and then with another clean and dry microfiber towel, go back and wipe it dry. Your boat has officially been to the spa and emerged with the Ultimate Finish!! My next entry will be about the YachtShine Phenomenon. You will be amazed at how many different surfaces it can be applied to – all with stunning results. In the meantime, let me hear your boat polishing stories, or feel free to submit questions or comments below! The foremost authority on boat cleaning, Captain John manufactures the #1 specialty boat cleaning products available on the market. Get tips on boat and yacht cleaning techniques, ask questions and share your experiences. © Captain John's Boat Brite | Boat Cleaning Advisor Blog. Simple theme. Powered by Blogger.